Herbs have been around for thousands of years and humans have used them for as long as they’ve been around. With literally thousands of different ones out there, it’s very difficult and time consuming to know which are the best herbs for your skin and overall health. Below are the top 20 known to be very beneficial for your skin (in confunction of course with a healthy lifestyle which you can learn more about throughout this site). Please keep in mind that organic, pure herbs are nature’s tonics and are only meant to be taken in relatively small doses as per manufacturer’s packaging. Less is more and when used alongside with plenty of fresh fruits and vegetables, they work miracles inside your body and skin. Where possible, we have reviewed only the highest quality organic, cold-pressed (where possible) herbs for maximum benefit to you. Take a look at these picks for the top rated organic herbs for the skin in 2018 as they have received consistently high ratings from folks who have used and reviewed them. This adaptogenic herb (one that targets your adrenal glands and helps control your body’s stress response) is one of the most powerful herbs in Ayurvedic medicine. It is also known as “withania” and “Indian ginseng” because of it rejuvenating benefits. 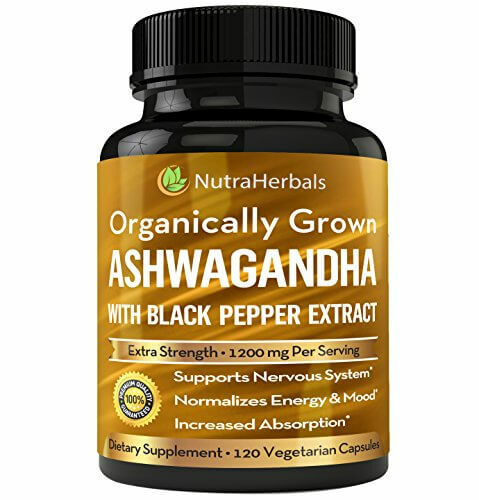 In Sanskrit the word “ashwagandha” means “the smell of a horse” for its distinct odor and admirable qualities associated with a stallion like vigor and strength. 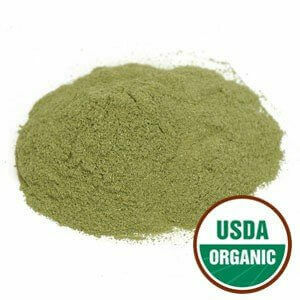 Ashwaganda helps alleviate stress, fatigue, poor concentration and lack of energy. Some of its healing properties are: strengthens immune system, improves memory, mind sharpness and learning abilities, protects brain from degeneration, lowers cortisol, reduces anxiety and depression without any negative side effects, helps in stabilizing blood sugar, lowers cholesterol, improves skin, reduces menstrual pains, improves fertility, enhances sexual potency, increases stamina and endurance, helps with insomnia and above all, lowers inflammation. It also strengthens the adrenal glands and balances thyroid hormones, and helps to bring body back into balance. Many people report a significant surge in energy within a week after taking it such is its ability to turn on burnt out adrenals. 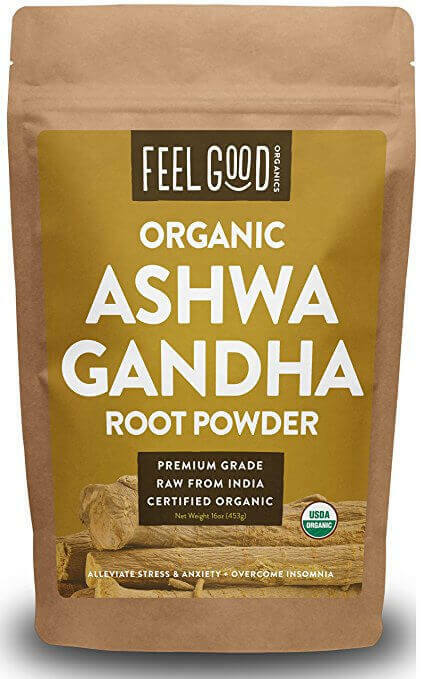 Ashwagandha root is the part of the plant that is used as medicine. Just be mindful when taking it in straight powder form as it has a strong, clay-like, smoky taste. This can be quickly removed by simply mixing it with a little juice or adding it into a smoothie. Available in: capsules, caplets, powder & extract form. Having over a dozen known health benefits and known as a potent stress reliever and also an adaptogenic herb, holy basil is also one of the most effective at healing, soothing and rejuvenating the skin from the inside out. You can use this in several ways including eating the leaves raw, drying them and making a powerful tea, rubbing it directly onto your skin or or washing your face with it’s natural oil. Taken internally, it is loaded with skin friendly Vitamins A & C and loaded with antioxidants. These protect you from the by products of metabolic waste (free radicals) and is very well known Ayurvedic medicine to halt premature aging, especially in the face. It’s a naturally strong germ killer with its antibiotic and antifungal properties making it a perfect revitalizing face wash.
Tulsi can also be easily planted indoors or out where it can provide you with incredible benefits year round. Eat the leaves straight from the plant making sure to pick the mature ones as often as needed since this is vital for the plant to rejuvenate. 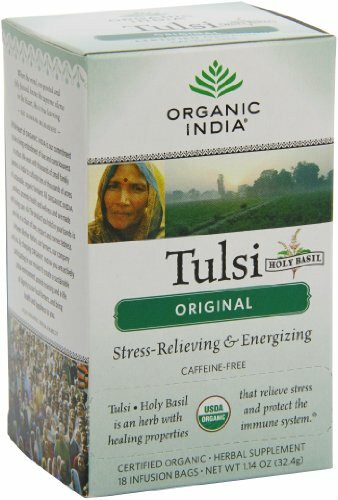 Tulsi has a distinct clove-like taste when eaten raw with a spicy after taste and is quite strong when made into a tea so you may sweeten it accordingly. Simply dry the leaves and use them in tea when you like. Taken in capsule form or as a tea, it targets your adrenal glands and helps them better respond to stress. It also promotes better sleep and a healthier respiratory system, encouraging your body to clear out congestion so you breathe a whole lot better. Available in: tea, tea blends, loose leaves, capsules, tablets, powder, extract & essential oil form. A known ultra powerful anti inflammatory, it reduces acids in the body considerably when ingested which is why it’s been effectively used to heal folks with anything ranging from respiratory problems to cancer. This is particularly useful for your skin since reducing the acid load inside the body will reduce the likelihood your lymphatic system backing up and seeping through your skin via acne and other common skin problems. On the outside, many women use turmeric face masks as they aggressively vanquish surface pimples and deeply condition the skin. It is very widespread in Southeast asian cooking; characterized by its bright yellow-orange color. Just be mindful when handling it in raw form as it may temporarily stain your. Because of it’s messiness, many opt for the capsule or tea form. You can take it by nibbling on it fresh which most people would find too bitter, or you can juice it into a glass, combine it with hot water and honey and make a golden drink out of it which is a lot more palatable. Or you can do what many folks do and just take it in powdered capsule form. 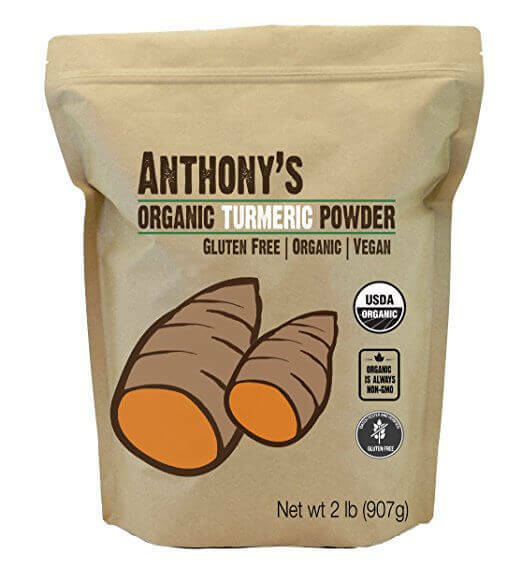 But there’s a little hidden secret with this little herb a lot of folks don’t know – fresh, organic turmeric is absorbed by the body up to 300% better when combined with black pepper! 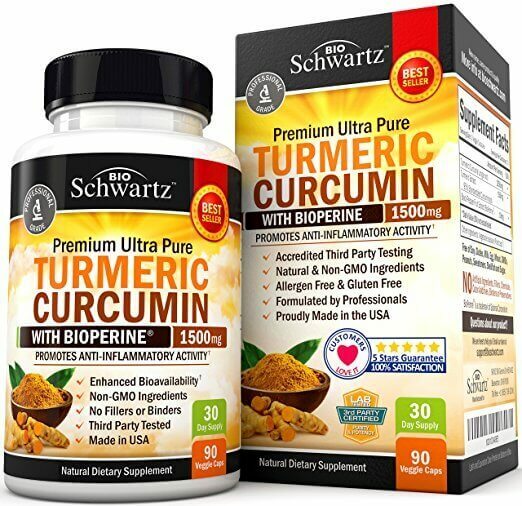 I’ve made sure to recommend only the best quality turmeric combined with black pepper so you can maximize it’s benefits. Available in: powder, capsules, tablets, liquid extract and softgel form. Extremely well known in the beauty industry and common throughout many product lines, aloe vera is nature’s supergel that is loaded with skin loving minerals and nutrients. It is a cooling herb often used to relieve sunburn, skin burns and cuts but it’s use as a skin beautifying ingredient dates back to the Ancient Egyptians. 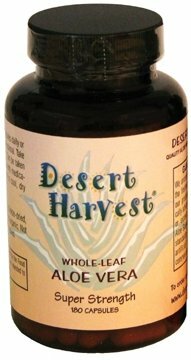 Since it grows in hot, dry conditions, it’s plump leaves store water and it’s this richness and density in it’s gel that contains so many beneficial elements that people have used not just on their skin, but hair and internally to relieve other ailments. In fact, it contains over 75 nutrients that we have identified (vitamins, enzymes, sugars) with many more still to go. It has a staggering amino acid profile as well. Get this: It contains 20/22 amino acids required by us and a perfect 8/8 on the essential amino acid scale! It’s healing properties come down to it’s amazing ability to reduce inflammation making it not only a very effective burn treatment but also extends to other “hot”, acidic conditions like acne and psoriasis. For maximum benefit, use as recommended but internal use for heartburn or digestion issues are best taken in capsule form while external use for skin issues receive far greater results when the gel is physically applied onto the skin. It quickly absorbs without leaving any greasy residue and contains nothing artificial: just pure, organic, cold pressed aloe vera gel. A truly special plant that many users rated quite highly on the results they were getting. Available in: gel, juice, powder, cream and capsule form. Probably the most well known (due to its distinct odor!) 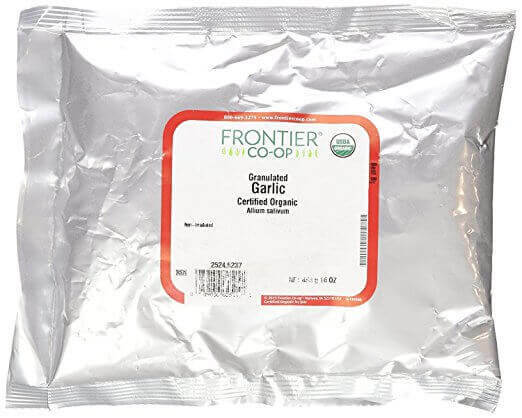 and oldest medicines around, garlic is an extremely formidable spice rich in essential vitamins and minerals such as C, B6, iron, calcium and selenium. It is a powerful anti inflammatory carrying just as effective antiviral and antibiotic properties without the side effects of prescription drugs. How it helps your skin is not just limited to it’s ability to reduce inflammation and kill certain acne aggravating bugs but it does something even more important. It gets to the root of your skin problem by actually cleansing your lymphatic system of built up, stagnant waste including cellular waste, parasites and anything that could make your lymph system back up casing many skin and non skin related issues. As well as decreasing blood pressure and helping you de-stress, it also increases circulation which helps your skin by getting all the nutrition to your cells faster. If it’s strong smell isn’t a deterrent, raw, crushed garlic is the most potent form you can take it in. The more crushed it is, the more it releases its signature allicin compound known to carry great health benefits ranging from lowering blood pressure to reversing hair loss. Understandably however it’s odor has been a (valid) excuse for many people to not consume it regularly in the past but fortunately; this is no longer a problem. Capsules are now available so you don’t get the odor but you don’t sacrifice any of the benefits either. Available in: raw, minced, power and capsule form. This is an easily overlooked herb for the skin because in a large produce section it is inconspicuously hiding usually between larger, bushier greens. This herb is easily grown in a pot or in the garden and thrives with adequate sun and water. As it matures its stems are very moist, releasing a unique, juicy flavor upon biting it and it’s leaves are buttery soft. Cilantro is packed with amazing skin saving components: chlorophyll, phytonutrients and vitamins A, C, E, K as well as potassium and magnesium to name a few. It is well known in natural health circles as a heavy metal detoxifier as it binds to metals such as cadmium, mercury and lead, removing them from within your body’s tissues and reducing any chance of you getting ill as a result. But perhaps its biggest impact in terms of skin health is it’s absolutely incredible ability to target and clean out your kidneys. By helping kick start them again, it is going to the nucleus of the problem by unblocking your body’s sewer system, allowing the kidneys to effectively filter out cellular waste via the lymphatic system. When this backed up waste gets released, it means it greatly minimises any chance of it seeping out via the skin which results in what we know as acne, eczema and other skin conditions. 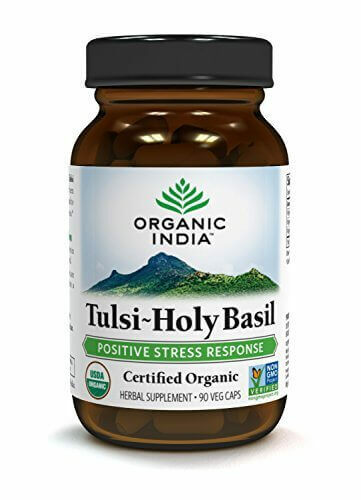 Since it has such a healing effect on the kidneys, it also has the added on benefit of being a great stress reliever which helps you maintain balance and keeps your stress hormones in check. Take it either fresh or in premium dried form – a great way to add it is sprinkling it on your favorite meals for a great tasting addition. Available in: dried leaf, extract, tea, powder, capsules, essential oil and tincture form. 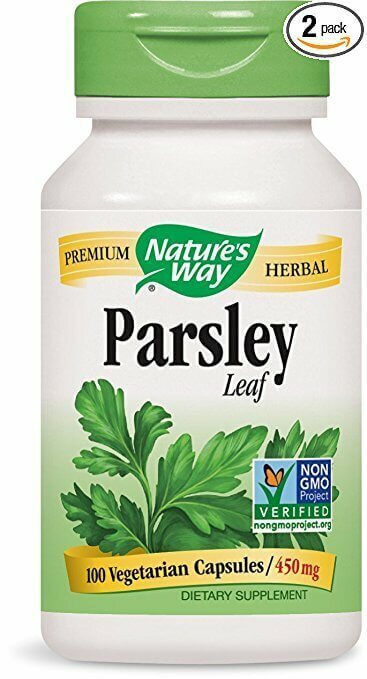 Parsley is a flavorful, popular herb used extensively in Middle Eastern cuisine and renown for it’s distinct taste and dish enhancing flavor. Considered as wild as a food can get, it grows very easily and quickly in a garden and often can be very difficult to get rid of if not contained. What isn’t known however is just how good this herb is for the kidneys and liver and it’s special ability to alkalize the entire body. When taken in regular and measured doses, parsley helps the kidneys filter lymphatic waste and as a natural anti inflammatory, is very cooling to the rest of the body. It has another added benefit: it pulls out environmental toxins from deep within your tissues like pesticides, DDT and the like. Loaded with many essential vitamins and minerals such as vitamins A, C, E, K and B6; it provides the body with detoxifying chlorophyll which cleanses the blood and liver. This translates to clearer skin all over the body and an overall sense of well being. Parsley can be eaten in raw, juiced, dried or capsule form and is an excellent garnish as a post meal mouth freshener. It is particularly effective when juiced with celery juice as the combination of each mineral salts practically alkalize and revitalize the entire body across all systems. Available in: capsules, powder, tea and flakes form. 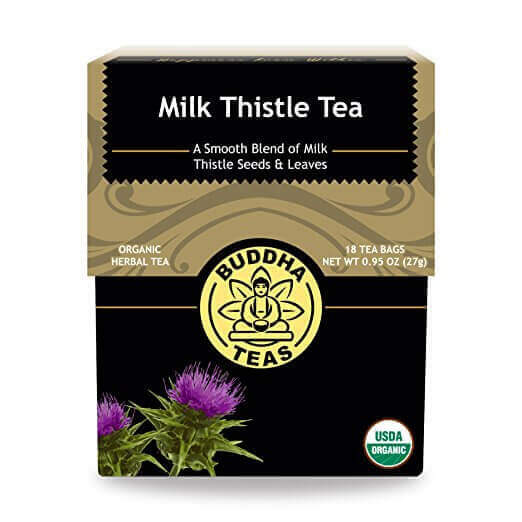 From this list, milk thistle is renown for it’s specific liver healing and protection properties. 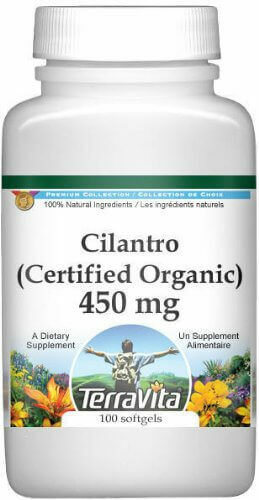 It protects the liver from statin drugs, viruses and toxins allowing it to perform at its optimum function. You will notice when there is a problem with the liver and surrounding area, the skin takes on a very sickly pale/yellow color (jaundice) but when it’s in good condition, the person takes on a healthy, natural glow. It’s a natural anti inflammatory actively fighting all types of acidic conditions like liver cirrhosis, bursitis, eczema and rosacea. Nutritionally, it’s an excellent source of antioxidants which fight free radicals that cause oxidization and accelerate the aging process. It also has plenty of iron, zinc and selenium – all essential for healthy blood and skin. 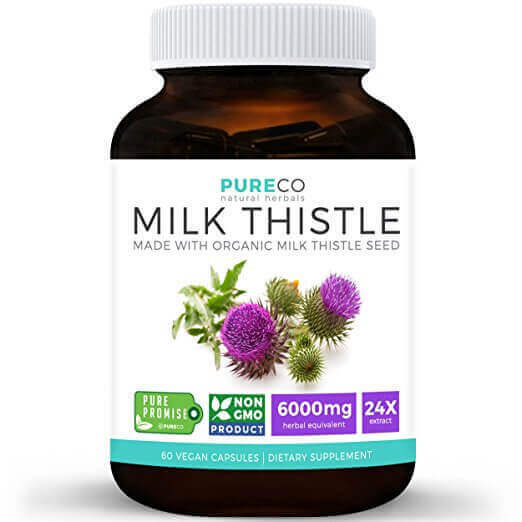 One thing that’s very important when buying organic milk thistle is to realise it’s most powerful compound that makes it such a wonder herb is called silymarin. This is where it’s healing properties stem from so be sure to get a pure product that contains a minimum 70%-80% silymarin, like the one recommended here. It’s readily available in tincture, tea or capsule form. Available in: capsules, tea, blend, gelcaps and dried form. This herb is a one man army benefiting everything from the skin, hair, destroys tumors, protects the liver and kidneys, easily handles edema and is also excellent for diabetics and asthmatics. The fact it looks after both kidneys and liver should be a very strong sign of just how good this herb is for one’s skin and overall health. Your liver filters your blood, toxins and produces chemicals essential for survival. Kidneys filter your body’s cellular waste out. When any of these two organs are compromised, one of the first signs is problematic skin. The fact it is so good to both organs cannot be overstated! 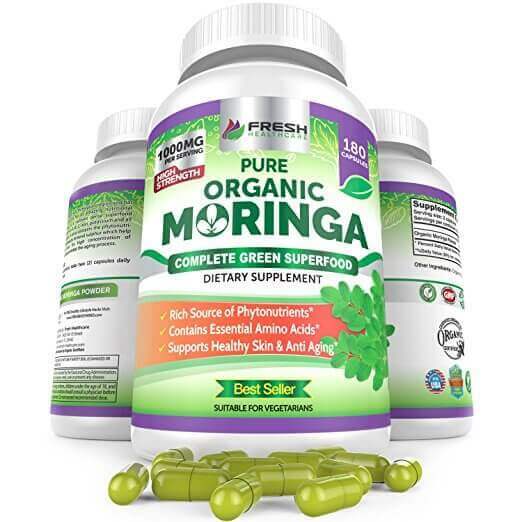 It’s also a well known hub of antioxidant power – more than 7 different types reside in this plant that prey on free radicals which speed up the aging process due to oxidative stress. 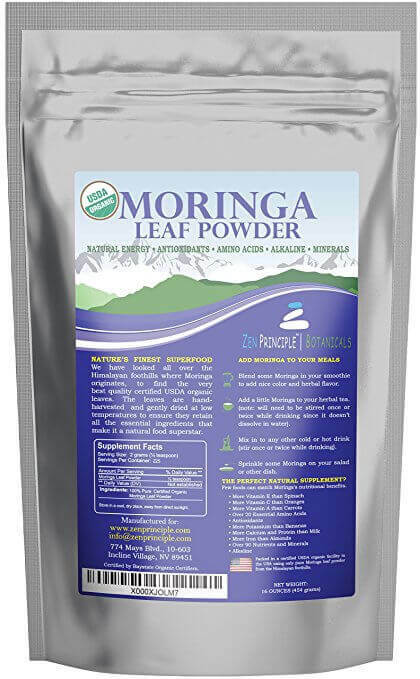 Moringa gobbles them up, slowing down the process and leaving your skin looking bright, supple and young. It’s heal-all capabilities is due to it’s very dense nutritional profile: Together with its antioxidant goodness, it also contains vitamin A and vitamins B1-B3 and B6. Mineral wise, it’s chock full of iron, calcium, zinc, magnesium, potassium and phosphorous. These vitamins and minerals are absolutely critical for skin health as well as other bodily functions and processes and the fact this plant is so dense with so many of them, make it a modern day must-have herb for anyone serious about healthy skin and/or overall health. You will notice many top green drinks these days have this as an ingredient as it’s just as effective on the inside of the body as it is on the outside. Available in: powder, capsules, tea and oil form. This herb is one of the most common plants in the world, growing just about anywhere yet people consider it a “weed” often killing it without realising they are removing one of the oldest and most effective kidney cleansers available. 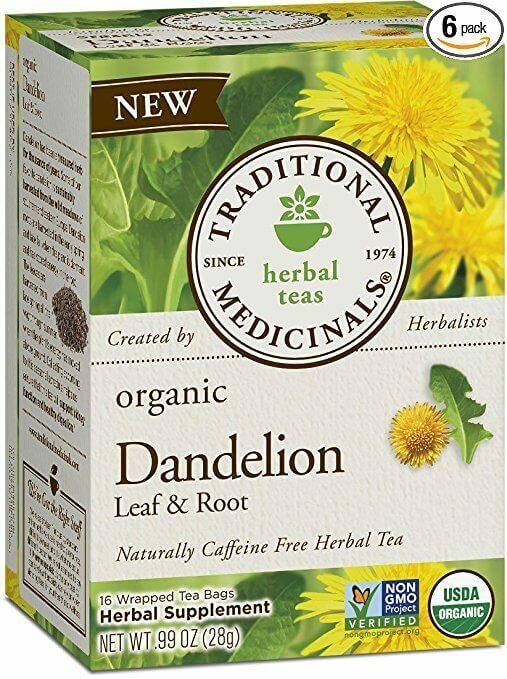 With it’s distinct yellow flowers and serrated leaves, dandelion is a bitter green that detoxifies and cleans the kidneys and liver like no other plant. The entire plant is edible and beneficial – the leaves are moderately bitter, the stem and flower are both edible and are a lot less bitter bordering on sweet and the root is used in teas found in just about any health food store. It is packed with Vitamins A,C, E & K – and it is this particular vitamin’s richness that’s so vital to skin health. It contains more protein per serving than spinach so a good way to introduce it to your diet is by dispersing it’s leaves on a salad or even mixing it with cooked greens like collards or spinach. Used topically, the milky sap that exudes from it’s stem is excellent for skin irritations as well as chronic conditions like acne and eczema. If you are going to take it regularly, also be in for a pleasant surprise – it’s a natural diuretic so your frequent trips to the bathroom is because it’s helping you shed water weight so it’s very effective for those with edema. Dandelion is readily available in your front or backyard but if you cannot bring yourself to eat it raw (after washing it! ), then it also comes in a variety of teas and capsules made up of both the root and leaves. As always, look for the purest, organic brand that doesn’t use pesticides for maximum benefit. Available in: capsules, powder, tea and oil form. 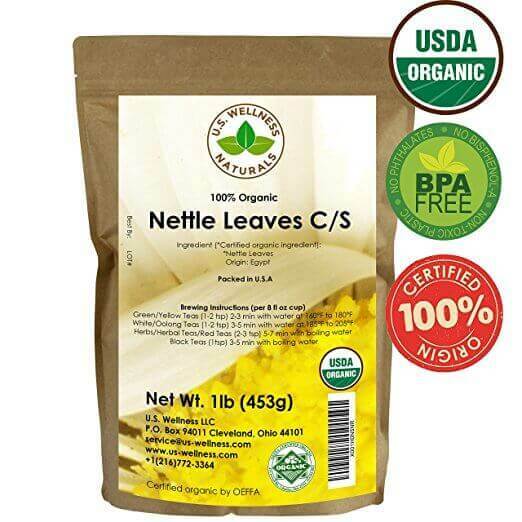 As it’s name implies, stinging nettle is a prickly perennial with excellent anti inflammatory and healing properties that date back thousands of years. You may have been unlucky enough to brush past it and felt its sting which comes from it’s fine hairs. However as unpleasant as it may appear, it’s medicinal qualities are unquestionable. It’s very rich in vitamin A, calcium, potassium, iron and magnesium – all of which form the essential nutrients for circulatory health and getting nutrients to all of your cells. It’s also high in dietary fiber which helps keep your colon moving expelling digestive waste regularly. 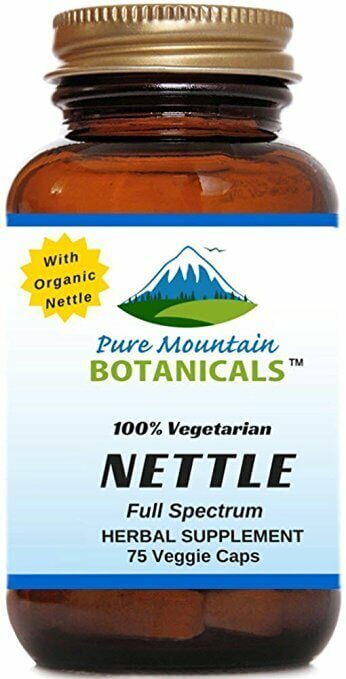 Since nettle has a naturally occurring antihistamine property, it is excellent for skin conditions like psoriasis, eczema and acne. Attacking these ailments on both fronts both internally and topically provide the very best relief. Cream containing this as a main ingredient has been shown to be very good at cooling rashes and itches. It goes without saying you should never eat this plant raw or handle it without using adequate gloves. That’s why it’s very popular in tea where one can enjoy it’s benefits or even via capsule form. It is a very flexible tool to have in your herbal cabinet as it is used throughout the world to soothe everything from skin conditions, allergies and joint pain. You can also get it in cut and dried leaves (minus the stingers!) if you wish to make your tea yourself. Available in: capsules, loose leaf tea, powder and tincture form. 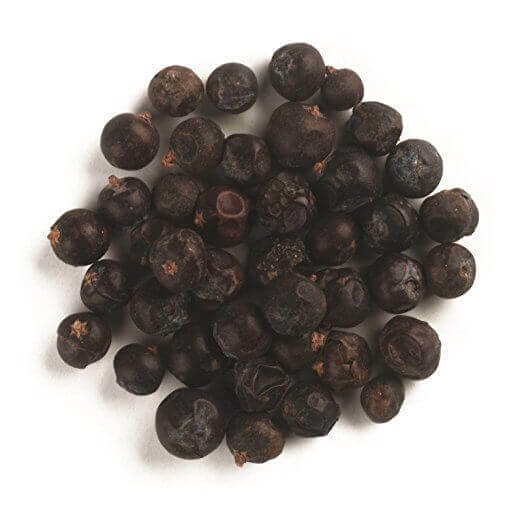 Not actually a berry, juniper berries are antioxidant rich seeds that are popularly used in essential oil form to treat skin conditions like eczema and acne. This concentrated load of antioxidants combat internal stress and help alleviate signs of aging, leaving your skin youthful and radiant. It also has extraordinary skin healing abilities not just for chronic conditions like acne but also for healing wounds, skin pigmentation ailments and old scars. Perhaps one of its underlying reasons why it’s so good at so many things is herbalists for ages have been using it to drastically improve kidney function. The kidneys are the hub of filtration in the body acting as both eliminative organs and regulating internal bodily functions. Many report a marked increase in kidney filtration after consuming juniper berry which can be seen by way of “cloudy” urine rather than clear. It’s also very useful for reproductive and digestive health, relieves cramps (excellent antispasmodic) and purifies the blood. When you combine these benefits, juniper berry is a must have for anyone serious about improving their skin’s overall health. They come in many forms with the organic products really have consistently high ratings from users. Available in: berries, essential oil, capsules and tea form. 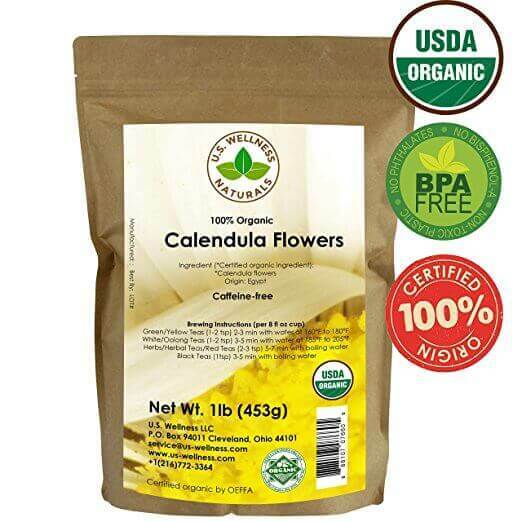 Calendula is a potent antiviral, antimicrobial and anti inflammatory wonder flower that has been used for thousands of years and even today, is used in numerous types of skincare products. It’s oil is a well known healer of the skin and the rest of the plant has been used extensively for cuts, scrapes, insect bites and other minor skin wounds. It enhances the skin’s appearance noticeably by increasing circulation and thereby blood flow to your cells. Couple that with its special ability to reduce wrinkle appearance, scars and liver spots (aka age spots), and it’s easy to see why it’s such a coveted plant! Since it is so skin friendly and antibacterial, it makes for a revitalizing face wash that actively works to minimize any surface imperfections like acne and eczema. The flavonoid content and linoleic acid of calendula give it it’s strong anti inflammatory properties and since they are quite high in this plant, it’s also used as an excellent anti aging agent. A herb that contains this level of acid fighting ability will always be a powerful skin saver whether used internally or externally. Take it internally for numerous health benefits like oral health and general alkalizing of the body and externally in cream or gel form for skin complaints or if you just want your skin to look it’s absolute best. Available in: salve, powder, flowers, oil, tea, cream, ointments and capsules. One of the more beautiful herbs, goldenrod is a healing powerhouse for the skin. It’s a natural diuretic so very good at helping shed excess water weight or if you have edema. 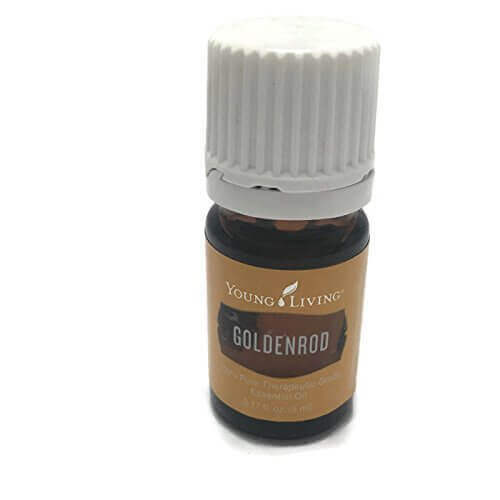 Goldenrod is also naturally antifungal and antiviral so it helps remove toxic fungal and viral loads from your body. It’s also an expectorant which helps expel mucus and any other blockages. It’s absolutely critical your body is allowed to expectorate and not suppress as is customary in today’s very sick world. Perhaps it’s most impressive quality is it’s great benefit to the kidneys and not surprisingly as a result, it’s a strong anti inflammatory. By helping the kidneys filter stagnant lymph, it helps facilitate the expulsion of acids within, allowing the toxic load to not overburden the body more than it needs to which inevitably results in skin issues. Not only is it strong lymphatically, but it helps the kidneys get rid of stones as was acknowledged by Germany. The more one researches this wonder plant, the one more understands although it is widely used for skin issues, it has a holistic healing effect on the entire body. It comes in seeds and essential oil which should be used sparingly. ⊗ May cause allergies or drowsiness with certain medications so consult doctor beforehand. 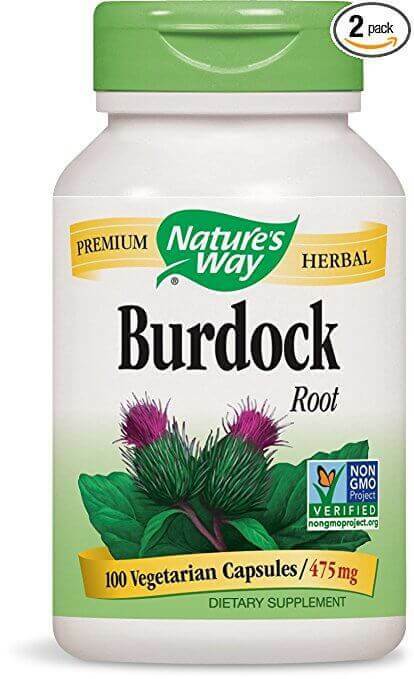 Burdock root is a special herb that also goes right after the root cause of skin conditions. When your cells break down, the lymphatic system which is your body’s waste disposal system is designed to move them out along with other metabolic waste, damaged cells and the like. In a healthy body, it’s moved out via the kidneys but in a sluggish system, the kidney doorways are obstructed so this waste gradually creeps out via the skin. This is what we see in various forms of skin conditions like psoriasis and eczema. Burdock root works by cleaning out your lymphatic system which directly translates into clearer, healthier skin by helping it drain via the kidneys which automatically detoxifies the body of internal waste. Since it also detoxifies the blood which feeds your cells, healthy skin is a by product since you get clean blood, clean liver, kidneys and much cleaner lymphatic system – these are the nucleus of skin health! It neutralises acids (inflammation) internally with it’s highly alkaline composition bringing much needed relief to those suffering from hot conditions like rosacea, eczema and acne. 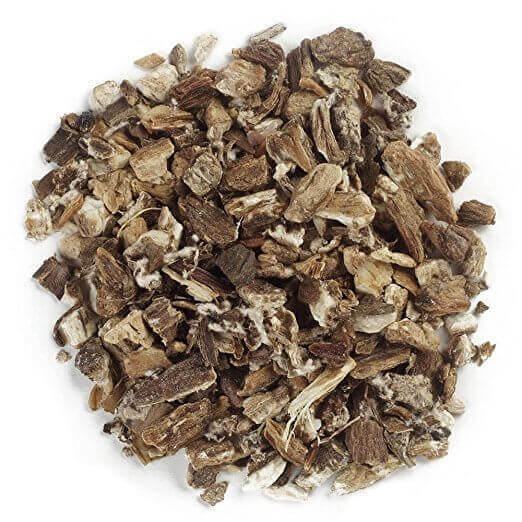 Burdock root is also used topically in many skin creams for psoriasis, acne and other skin conditions with great effect which is why you are seeing a surge in products with this as a key ingredient. Pleasantly sweet tasting and crisp, you can consume it raw or in both tea and capsule form. 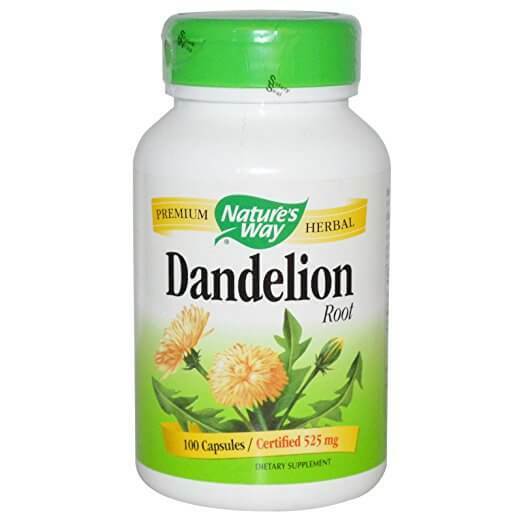 It very closely resembles dandelion in terms of it’s excellent health benefits on the body and skin. Schizandra Berry is one berry you would likely never have heard of but wish you had. In a world dominated by blueberries and other delicious berries, this particular berry is an absolute monster when it comes to skin and overall health. This simply means it will adapt to whatever is required from the body in order to bring it back to balance. It’s like a herb transformer! 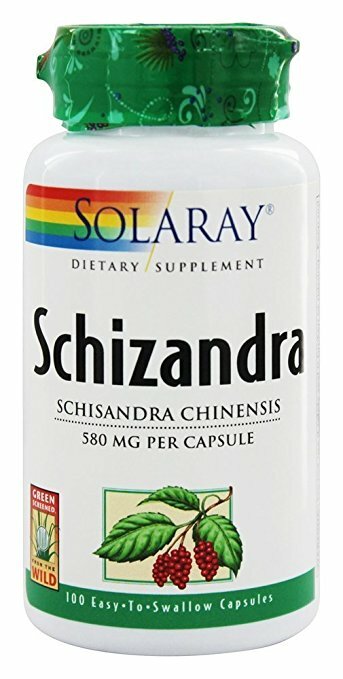 The Schizandra berry is brimming with antioxidants which makes it a very effective anti aging / anti wrinkle herb. It also has the ability to keep the skin well hydrated and moisturized helping it retain its fullness as well as being anti inflammatory to actively fight acne, eczema, psoriasis and other chronic, acidic skin conditions. There’s something else vitally important in this berry – it has a special ability to also cleanse the liver and blood which directly end up feeding your skin (and other) cells. 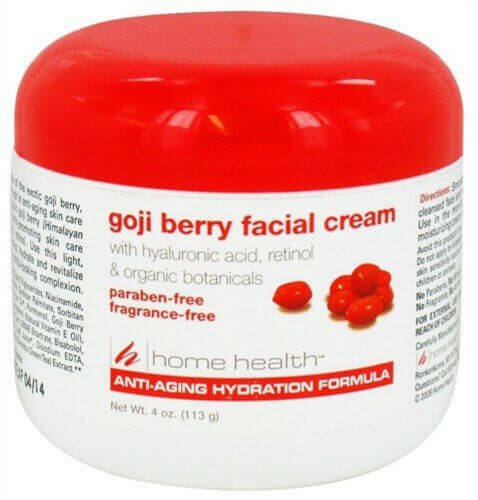 This berry has a comprehensively positive, holistic effect on the skin on so many levels. You may also notice a significant improvement in your sleeping patterns and muscle and nerve pain due to its strong anti inflammatory properties. Available in: capsules, tea, tincture and powder form. Egyptian geranium oil is one of the most powerful skin tonics known and has been used for skin beauty since the Ancient Egyptians. It slows down the aging process by inducing contractions throughout the body, tightening the skin and giving an overall appearance of youth and vitality. It’s an astringent – meaning it pulls aggressively so it’s also very effective in preventing sagging skin and believe it or not, toning your muscles. You only need to add a couple of drops to your natural face lotion 1-2 times a day. Don’t overdo it as it is a very concentrated, strong oil. Many users reported to have seen their age spots and wrinkles disappear after just a few weeks using this highly prized oil. It actively fights chronic skin conditions like dermatitis, eczema and acne. You can use a tiny amount of an organic carrier oil like jojoba or coconut (approx. 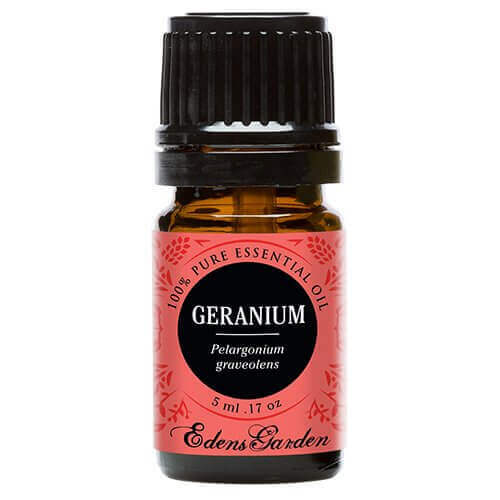 a teaspoon) with 3-4 drops of geranium oil, lightly apply until you see improvement. Another handy skin benefit is how effective it is in healing scrapes, insect bites and cuts. It can also accelerate scar fading by increasing circulation which feeds your skin cells faster allowing for faster skin regeneration. As a result, you look clearer from any chronic skin conditions. As amazing as all of these benefits are, one very unique quality of geranium is it supports the birth of new skin cells! So it’s benefits are not limited to topical applications but even at the cellular level. Finally, like many herbs, this is naturally anti inflammatory which means it cools the hot, acidic load in the skin thereby reducing the incidence of rashes and other skin ailments. The goji berry is an antioxidant rich force of a berry that packs a nutritional punch far above it’s tiny size. It’s sweet, delicious chewy texture belies its powerful skin saving qualities. Just a quarter cup will give you 90% of your daily selenium requirements, around a quarter of your potassium needs and a staggering 100%+ of four other vitamins! It also comes loaded with 18 amino acids including 11 essential ones our bodies can’t produce on their own. Since they are also very high in iron, they are an ideal choice for those who are anemic but without the loaded saturated fat and cholesterol content found in animal products. Many women who’ve just given birth snack on these for their iron! They are renown in Chinese herbal medicine to contain anti aging properties which comes as no surprise given their rich beta-carotene content. 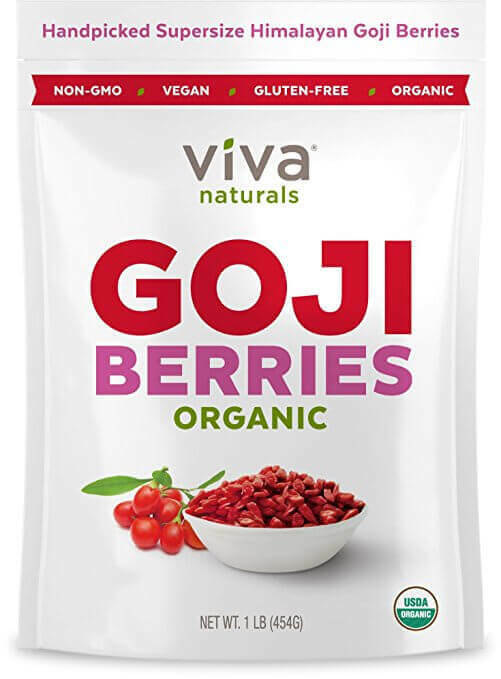 Gojis also have a good reputation as potent liver cleansers which is absolutely essential for your cells to be nourished cleanly by your blood. Since your liver’s main job is to filter your blood prior to your body receiving it, having a clean, efficient liver means your cells will be fed from a purer source. This is why many see significant improvements in their skin once they complete a thorough liver cleanse. Available in: sun/shade dried berries, capsules, cream and powder form. 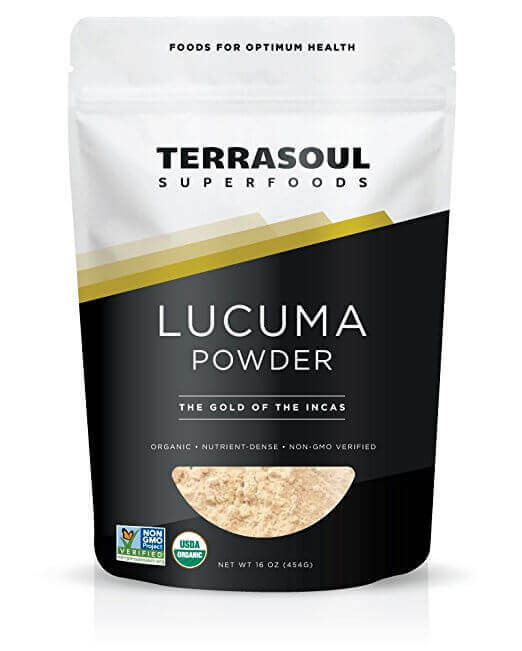 Lacuma is a deliciously sweet surprise often used as a natural sweetener but chock full of antioxidants, vitamins and minerals that the Incas have been using for it’ skin saving qualities for thousands of years. It contains more beneficial calcium per serving than a glass of milk (less the saturated fat and cholesterol) and it’s iron, zinc and protein contents render it a perfect skin food whether used externally as a mask or internally as part of a sweet smoothie. It has a delightful mango-maple syrup taste with undertones of peach but the fruit itself is very hard to get due to the fact it only grows at very high altitudes. This is why it’s pure powder is a great way to enjoy it’s benefits. It’s high vitamin A content is essential for skin cell regeneration as well as other benefits to the body like better eye health. In fact, it was found to have positive anti aging qualities due to it being a strong anti inflammatory. Something else many love about this plant is it sweetens foods and drinks without spiking one’s blood sugar so it’s excellent for diabetics as well. A natural anti inflammatory, it is also an efficient wound healer and that includes marks left by chronic skin conditions like eczema and acne. It’s pleasant taste combined with it’s exceptional nutrients and antiviral properties make lacuma a great addition to your pantry. 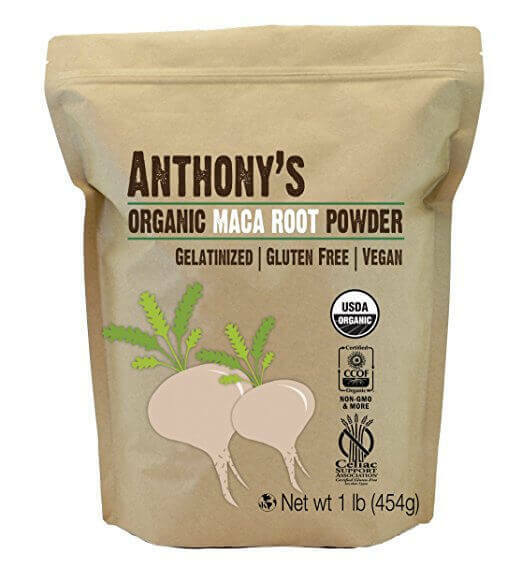 Maca root powder is somewhat of a skin altering herb I strongly recommend you add to your list. It contains so many essential nutrients required for healthy, glowing skin like zinc, copper, magnesium, potassium, iron and vitamins A, C, D and E.
Its amino acid count is at an elite 20 and it also contains vital fatty acids. It has been historically renown for supercharging male and female libido levels and indeed, many people have reported exactly that in their feedback. What isn’t known however is just how incredible this is for the skin. Under clinical study, it was found to actually boost the production and regeneration of skin cells, collagen and halt the aging process. This includes reducing the appearance of fine lines, sagging skin and age spots. As impressive as these qualities are, it was also found to balance hormones and help the thyroid and a healthy thyroid reflects directly on your skin. It also has excellent anti inflammatory qualities and assists the immune system which is crucial when trying to get rid of acne and other skin conditions. Not only does it contain incredible benefits for the skin; keeping it elastic and glowing but it also happens to be super dense in other nutrients that really benefit the hair and nails. 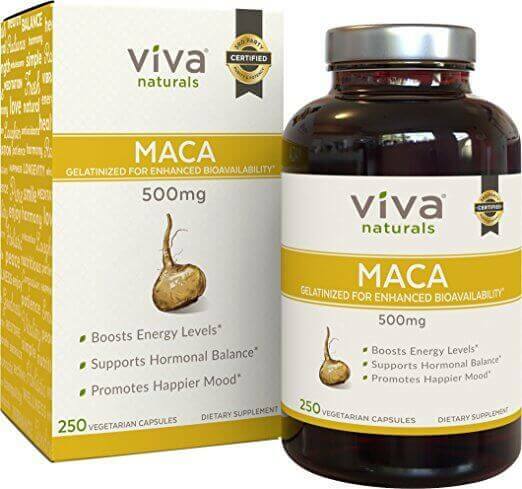 So your body will get a complete internal makeover when consuming maca root on a regular basis. It’s just as effective on the skin used as a face mask as it is internally to help with hormones and immune support. Available in: dried powder and capsule format. These herbs are the very best not just for your skin, but overall bodily functions. They’re naturally high in essential vitamins, minerals and phytonutrients as well as powerful antioxidants to not just keep your skin clear, but delay aging, remove old skin imperfections and restore your natural glow. These herbs are not just going to improve your skin’s overall appearance, but they positively impact your body without the “side-effects” of many chemicals and synthetic antibiotics which often just manage symptoms and not really address the root of the problem. Other advantages of taking these herbs alongside a healthy lifestyle: healthier, stronger hair, stronger nails, better sleep, faster recovery after exercise, better overall well being and many others cited by folks who took the herbs. Consult a specialist if you’re unsure and if you’re pregnant or nursing, be sure to double check the label to verify it’s all good before using it. Always source the purest, best ingredients when buying herbs and do not take them more than required as only small doses are needed to get positive results. Ultimately, the more of these herbs you can incorporate into your lifestyle, the better. Another option you may want to consider is Organifi green juice which I have reviewed in detail here. It’s packed with many of the skin friendly herbs reviewed here. If you have any questions about any of these herbs, please post them below as I’d love to hear from you or alternatively, email them to me. Previous Article Should You Pop Pimple? Anyways, I love the information provided here! But I was wondering, if you had to pick 3-4 of these things to incorporate, which ones would they be? Glad you found the site helpful and thank you for your kind words. I just ordered a few things off this list and plan to keep this info. Very helpful indeed! Wow!! This is so helpful! Best article on herbs for skin out there! Thank you, glad it was of use to you.